Click on the play button above to stream it here. Or listen to the episode on Podcast One, Stitcher or Apple iTunes. Or use any Podcast app with our RSS feed. HOST: In March 1981, the iconic British rock band, Queen toured Argentina. In the capital, Buenos Aires, thousands of fans flocked. HOST: At the same time, a group of homeless people were moving into tracts of land on the outskirts of the city. The squatters had no legal right over the land. It was owned by absentee landlords, who tried to fight back, and evict the homeless. But the landlords discovered an important lesson. When you’re fighting someone who’s got nothing to lose, it’s going to be a tough fight to win. The squatters mounted a major campaign to stay on the land they’d made their home. HOST: Three years after they moved in, the Argentinian government passed a law that handed the squatters legal title to the land. Some landowners decided to fight the expropriation — claiming they had been insufficiently compensated by the government. Others took the government’s offer and moved on with their life. Overnight, some squatters became property owners. Others were left with all the uncertainties of squatting, knowing that a decision by a judge could see them evicted at any moment. It was the perfect natural experiment. So what happened to the two groups over the next twenty years? HOST: Today on Changemakers, I’m not in Buenos Aires. Instead I’m in Bangkok. You might think that if you were a landowner, it would never be in your interests to hand land over to squatters. But today we’ve got a story about a remarkable group who are challenging exactly that sort of thinking. Let’s go. HOST: I’m Amanda Tattersall, welcome to Changemakers, the podcast telling stories about people changing the world. We are supported by the Sydney Policy Lab at the University of Sydney. They break down barriers between researchers, policy makers and community campaigners so we can build change together. Check them out at sydney.edu.au/policy-lab. HOST: At the same time that the experiment in land titling was occurring in Buenos Aires, a young Thai architect was conducting her own experiment. SOMSOOK: I was looking for housing development as sort of a model in which community would be stronger, community would get together. HOST: Her name was Somsook Boonyabancha. She travelled to Copenhagen, where housing is often shared in cooperatives, thanks to a legal system that makes it easy and popular. SOMSOOK: Even one big house maybe three families want to purchase that house together and to have a more collective living, common cooking, common library, or so, you can do so they have that umbrella. I mean legal umbrella, to make the collective living possible. HOST: And it doesn’t just work for two or three families. Sometimes cooperatives can involve joint ownership by hundreds of families. SOMSOOK: You share things and so on, and while you also have your private space of your own family….you have a larger community like a town where the rural and the urban mixed together and they share, the work, they share the very many things. HOST: And, Samsook noticed, it wasn’t just for the poor. HOST: Levels of community were nested within one another like babushka dolls. Then they were integrated with the wider city government. And all within a legal framework that gave them rights. The thing that struck Somsook was how much it looked like the squatting communities back home in Bangkok. SOMSOOK: Their link together is not registered as a co-operative as such, but the way in which they link together, they have committees to do this and that is really very interesting really quite exciting. HOST: For a young architecture student, the cooperative model made sense, especially in a city. Most legal systems treat each individual as the basic unit. But in a crowded city, that’s a legal fiction. SOMSOOK: You live together, you protect each other, you help you lend a hand to your neighbors. HOST: As an individual, a city can seem very big. But in a cooperative, the city feels a lot more manageable. SOMSOOK: So housing co-operative is a legal platform to make that common challenge living together, also a legal acceptable process yeah. HOST: After she’d finished studying in Copenhagen, Somsook came back to Thailand, a newly minted architecture graduate, brimming with hope, inspired by what she’d seen. It was the beginning of the 1980s, and Thailand was very poor. But urbanisation was already taking hold and squatters were moving in to any spaces they could find in and around the city of Bangkok. Sombook got a job with the National Housing Authority, a government body that was aiming to help these squatting communities. The idea was to help makeshift communities upgrade their infrastructure, so that they had electricity and sanitation. But it required whoever owned the land to agree. Soon after taking the job, she came across one community that was in a difficult position. SOMSOOK: The community lived there for a long time and being in the land in which is left, big land which is left for quite a long time. Eight hundred families. That’s quite a big community. HOST: Around this community, the city was growing. And the value of the land they were squatting on was increasing. SOMSOOK: Then come the time when development surrounded the area. There was a new street cut through the area. There was a new opportunity that land in the area become so more and more expensive. So come the developer who feel that the land would be good to develop for something else. HOST: Bangkok already had a process for landlords who wanted to get rid of squatters. It was fairly straightforward and pretty brutal. SOMSOOK: Then you enter into an eviction process where the developer wanted the people to more out and they give some minimal compensation. HOST: Remember, many of these families had lived there for years. They figured, just because a piece of paper gives the landlord ownership doesn’t mean it’s right. It’s not like the landlord had been using the land. So they decided to fight. Somsook found herself at the centre of the discussion. SOMSOOK: They have meeting at nine o’clock at night, ten o’clock at night, and you were sort of joining that one. You sort of have some status to help out although my role is very informal. HOST: The way Somsook saw it, they had two options. HOST: Some people thought that there was a third route, all out war. They felt that negotiation was beneath them. That they deserved more. SOMSOOK: Some of them feel that well people live for a long time. They should have the right to own the land or something like that. HOST: To Somsook, it was clear what that position would ultimately mean. SOMSOOK: You have to adopt violence and put people to jail. You are going to go into a clash, and you would have the winner and you have a loser and being community people is not going to be the winner so easily. HOST: So little by little, discussion by discussion, the community came together and decided to try and negotiate. Getting the landlord to agree was a little trickier. SOMSOOK:The landlord of course was not too Comfortable because this is a new idea. You talk about land sharing, you know what, what? because land is owned by them. HOST: The community had to make them realize they had something to lose by not backing down. SOMSOOK: They made demonstration, the community, in front of the landowner company. Sleep in front of that for couple of days and it’s very dangerous. SOMSOOK: One of the tactic the people here always adopt is to block the street. Why blocking the street? Because, if you block the street the police will have to come. The police will be unhappy that you block the street the car cannot go through the lane. You block it so that the policemen will become a negotiator. Will be an intermediary, the middleman who have to talk to the landlord. HOST: Direct action created the grounds for a negotiation. Somsook played the role of facilitator. HOST: It was a win win. The community got 35% of the land, and legal title, and the landlord got the rest, without a protracted battle. HOST: Winning that one battle, set a precedent for all those that would come after. SOMSOOK: From this this kind of case in which the landlord learn how to share the land it become later on the policy of the organisation. I had the opportunity to talk to some of them later on. So what what do you feel after some time because in the beginning really beginning you were stand really firm that this is not possible this is illegal. But after this compromise and you could do your project quite quickly and the people have their housing. So what do you think. And a few of them would say oh this is a very good arrangement. We were very happy . ha ha.. So after some time they even have a good feeling about this more reasonable arrangement. HOST: But there was a problem. After she negotiated that first land sharing agreement at Rama forte, more cases started to come in. SOMSOOK:No matter how good you are when you spend say three year four year doing something make a change in one project. There may be 10 more slums emerge so what are we doing you know the scale of slums emerging is much faster than the solution and is the case in many many cases. HOST: The pace of urbanisation was just too great. Somsook felt like she was going backwards. There had to be more effective ways to create links that would maximize the gains from their wins. Somsook felt that the government she worked for should be facilitating solutions at scale that kept pace with the problem. But it wasn’t. So Somsook decided to quit. HOST: If the government wasn’t going to do it, Somsook thought, she would. We’ll be back in a sec. 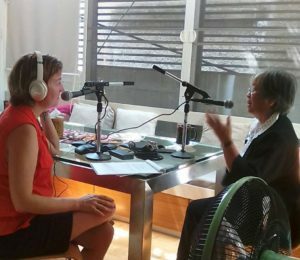 HOST: We’re following the remarkable story of Somsook Boonyabancha, who started out helping squatter communities negotiate for legal recognition of their land in Bangkok in the 1980s. But she had run up against a problem. SOMSOOK: We didn’t think the way in which the government had been doing, or The international agency intervened intervention this and that would ever to lead to any significant change in it. sorry to say. When we do a project by project.It’s the project of the development agency it’s their pets their babies, you know with good reason because the organization also want to do a proper improvement. The other community do not know why and how this particular project develop. So after the group have several occasions being together and we were we were serious people. Different people was serious people doing their serious work in their country, get together. Why don’t we learn from each other and build a network among ourselves. HOST: To that end, Somsook set up the Asian Coalition for Housing Rights. It brings professionals, community organisations and NGOs together to cross pollinate ideas, for how to develop housing and infrastructure better, in urban poor communities. Somsooks thinking was simple. At the moment, every time a slum came to her, it was like they were starting all over again. But what could be different if communities were linked together? SOMSOOK: Instead of you do a training in traditional manner in a classroom, you sort of let the participant go to the ground, okay? At that time I already make a study on the causes and effect of slum eviction in Bangkok, so I have a lot of slum information. Once I organise a training course I let these participants divide into groups and go into these different communities and see what will be the alternatives. Go to the real things. HOST: The idea was to make the slum’s problems everyone’s problem. SOMSOOK: You make the whole asia a University. We invite the community people the mayor the Government officer the professors to go together. to see things in another country. Where they can give you the answer, you know, you get stuck because we always we have certain political systém political culture to to fix ourselves and we don’t see what are other possibilities. But once you go to another country, ah, they can do it this way. Oh my goodness. And you get that inspiration and you start doing. HOST: By making it everyone’s problem, Somsook started to be able to work at the scale of the problem. It was 1988, and South Korea was due to host the Summer Olympics. To make way for the expected visitors, Seoul had started mass evictions of their squatting communities. SOMSOOK: At that time there was the serious problem of evictions in Korea. So we feel we should do something for Korea. SOMSOOK: So we send a fact finding mission we search for the money and then we organize a team of experts going there before the Olympic Games. And that was a good media attraction. So we went to different evicted communities and we make press release and We talked to the governments and so on and was quite a good success in terms of what the coalition contribute to the eviction problems and lead to the public housing policy of Korea later on. Okay so when we came back we we were so active in trying to see how we would be a new force of change. By being together from different country we had a few more fact finding mission. HOST: But even though they met with success, over time, there was something wrong with the way they were approaching the problem. SOMSOOK: We were feeling a little tired with the way in which you follow the problems, because there are so many problems. If you want to be housing rights and scream, “Oh, eviction this, eviction that,” fine with that, at the end nobody going to give you the solution. HOST: The trouble was that the problems causing the housing shortages were more fundamental than housing rights. SOMSOOK: We have to make change to the government. We can’t wait the government to make that change for you because it is not going to come, uh. So people have to wake up. people have to find what are the right direction. HOST: Frustrated, Somsook took a job with a big property developer. Her role was to come up with policy towards squatter communities. Her boss was an economist, who use to work for the central bank. He inspired Somsook to take things in a new direction. SOMSOOK: He’s very good about finance system. I’m on community process, housing and so on. We worked together as a team and at time I learn about money, finance, funds, and so on. He’s in that kind of technique, financial technique. He is very interested, very keen on community development, so try to see how money would be an important tool for the community. I’m sort of joining him and we proposed to the government to set up a community fund to allow people the tools, financial tools to do whatever they like. HOST: Somsook had finally gotten to the heart of the problem. The problem was more fundamental than building houses. Until that moment, the squatters had been largely locked out of the financial system that the landlords had access to. There was no system to allow them to pool their resources and negotiate as a community. But if squatters could access a fund that allowed them to pool their resources and develop some financial clout, things could start to shift. HOST: Thailand had a new government following a military coup. Their new prime minister was looking to modernize. Into this moment of opportunity rose Somsook with a radical plan. Rather than isolating individuals with mortgages they would never pay back, to buy private chunks of land they did not need, they could develop a system that was specific to the Thai understanding of what wealth really means. SOMSOOK: You don’t need to have your own your own your own rich or your own personal assets. You don’t need to feel like gathering your own wealth but you are part of the other. and the wealth will be shared with the others. HOST: They asked the government for a starting grant of 40 million dollars to establish the Urban community development office. Somsook’s credentials as a housing professional and her boss’s as a finance guru created a perfect storm. The government said yes. A new kind of community financing model was born which could roll out across squatter communities in Asia, empowering people to improve their lives. Any community organization could be the beneficiary of these funds, so long as they could prove they had the capacity to manage them. SOMSOOK: Give the power to the people and let them be the driving force, which they are always be. They build slums, they build houses without any money, without any legal status, without friends, without any support. They build houses all over the place, so they have a lot of energy, ability, so you just understand that energy, ability and organises a little bit. Get together same architects and the other and see how we make it better, cheaper, but you do it. We’re not going to do it because if the other people do it for them it’s not their way, so people have to find a way to do it together because it’s cheaper, it’s better, and it follow what they needs. Most of the housing by architects, ten storey, this and that, it’s too boring. People housing, they always sneak, they’re able to sneak and find space and ways, how to do their housing. Why don’t we go with that energy here? You just facilitate the financial system so they can make use of the finance and as long as they can repay here, what’s the problem with that? HOST: No problem at all. By 2000, over 650 community savings groups had been established throughout Thailand. Housing loans had been provided to 47 housing projects involving 6,400 households. More than 1 billion baht (around 25 million US dollars) had been provided in loans, and more than half the loans had already been repaid in full. In 2000, the Office was merged with the Rural Development Fund to form the Community Organizations Development Institute (CODI). CODI is rolling out an even more ambitious plan, called the Baan mankong collective Housing project. It was a Thai form of the cooperative idea that Somsook had seen in Copenhagen all those years ago. Collectively funded community run housing. 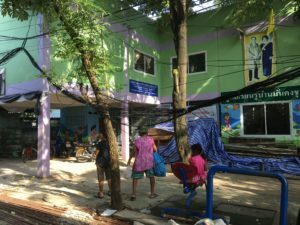 Here in Thailand the circumstances were very different – but the idea of a shared housing economy still had great resonance. I had so many questions about how the project actually transformed the daily lives of people in the squatter communities. So I went and talked to some of the residents. 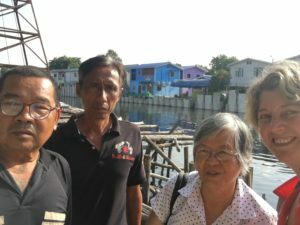 HOST: The Khlong Bua Environmental Development network is comprised of 15 different communities, totaling 3,800 families, that live along a 6 kilometer stretch of Canal in downtown Bangkok. WOMAN 1: Living along the canal, you may have some families who encroach the canals, so people in the city accused the people here that they obstruct the flow of the water and also make the water polluted. So what the community here have to do is to get together because otherwise you face eviction? And always every time there is flooding problem, they always point their finger to the community here. So they get together as a network. In the beginning is the network to protect the environment, clean up the canal, in order to show that instead of you being accused as the ones who make the problems to the canal, now you are the ones who actually clean up the canal. So they get together to clean up the canal and make the water quality better. HOST: The network was approached by the CODI officers, to be a part of the Banmankong collective Housing project. WOMAN 1: The 15 communities who joined together in the environment clean-up program are all agreed that they should move into this housing development activity, so they joined together and moved into the housing development activities, together as a network. HOST: That network of 15 communities operated like a cooperative. Every month two to three representatives from each community came to a network meeting where members of CODI would be present. They negotiated two things. The lease of the land from the Treasury department to the co-operative, and the community upgrading they would do once they got the lease. SOMSOOK: Find the information. Make a plan together, so that’s something is possible. HOST: CODI’s role is to get the right heads in the room to make things happen. To help solutions. SOMSOOK: Until now I would say we have more than two 300 housing cooperatives organized it through the housing project. HOST: The key to this whole thing, was that the co-operative model allows a sense of ownership which other models don’t. MAN 1: During all these arrangements, they have their workers to work with the community, but the communities are the owners of the project. HOST: This sense of ownership – communal ownership – changes everything. WOMAN 2: The quality of life changes a lot, status of the people changes. In the old days, when you live in the slums, you been condemned. You are the lower level, not being recognised by the larger society. But because of the housing project, your status totally change. Now you are equal. You feel proud being the group of people that have the achievement, and there are so many people from outside who come and visit our community. HOST: The sense of power generated by ownership extended into other areas of community life as well. HOST: It is an outcome that almost exactly mirrors the experience of Buenos Aires. Remember them at the beginning of the episode? There were two groups of squatters – one who managed to negotiate clear legal title for their land, and one group who were left in legal limbo. The group who gained legal title, found themselves more prosperous, with better education and health outcomes, less violence and smaller families than those who didn’t. The stability that comes from control over where you live is fundamental to how your life pans out. HOST: Back in Thailand, another outcome has become apparent: members of the co-operative have been inspired not just to engage with the physical state of the community, but with its politics. WOMAN 3: The leaders have to listen to the members. Every time they need to make a decision, you have to listen to the members or the ordinaries. HOST: The success of the pilot projects, meant that in 2005, the Thai government awarded CODI 240 million dollars to continue their work. SOMSOOK: At the end of the program a few years back is 215 cities where we actually support in 19 countries This city wide upgrading. So how we could find a new way in which we can make the platform of change by the people for the people and this is the only way to make the government better. HOST: Somsook is building the regional foundations for the participatory planning of our cities. She found scale. It only took forty years. SOMSOOK: In some way is not only to get some of the project on the ground possible but is also to build new kind of government system. And new kind of government should be an open system. Let your people help you to manage your city. You you have a lot of conventional government. Here in Asia. Where, the people who our government feel they have the authority and I have the authority to do everything by myself which is not the case! Whatever the issue make community an important actor to do that, not only the government or the private sector. And if we believe that one or two slum community can find a solution. Why not. More number of people. So this is very important direction between the project by the top down system or the project by the bottom up people themselves. HOST: Like with everything, its not without its struggles. Any kind of successful change making strategy will have its opponents, people who want to keep things as they are. MAN 1: There are politicians who sort of creating different factions in the different organisations. These faction agree with the upgrading, another faction are not happy with this. So there are political interference a lot more this day which make the present project more complicated. The grey area like the slum community are always the place where the politicians are influential, taking the advantage because they could support the community something, so the community vote for him, he’s sort of taking care, kind of paternalistic system where communities are their members under their parties, this and that. HOST: But for now, the squatter communities have legitimacy, and through CODI, access to the legal mechanisms of the state. Assistance from the police and a friendly army unit stationed nearby is common, so that individuals harassed by the underbelly of the political system can seek help. What was once the greatest threat to the stability of squatter communities, the government, has become their greatest ally. All because they embarked on a journey of negotiation, not all out war, all those decades ago in the small community of Rama forte. HOST: Almost 30 years later, that first community that Somsook helped is still there. These days, the Queens Sirikit convention center now sits across the road. Each week it plays host to conferences and events from around the world. The city continues to grow around the Rama forte community. Money and tourists still flow through the area. But on a little patch of land, 800 families have been able to claim and retain the rights of their community to grow as well. How do you continue a student climate uprising?